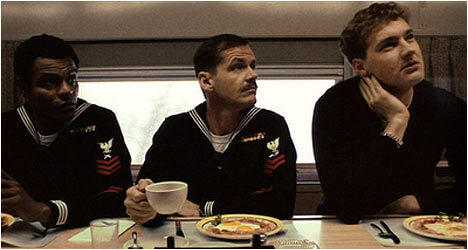 The Last Detail (1973) continued a fantastic run of films for Jack Nicholson in the 1970s. Armed with Robert Towne’s brilliantly profane screenplay and Hal Ashby’s assured direction, Nicholson delivered a memorable performance as “Badass” Buddusky, a veteran sailor enlisted, along with fellow petty officer Mulhall (Otis Young), to take a young sailor (Quaid) from Virginia Naval Base to New Hampshire Naval Prison where he’ll serve eight years for stealing $40. They’ve got a week to do it and decide to show the poor guy a good time before he’s locked up for a long time. It goes without saying that The Last Detail is anchored by the strong performances from the three lead actors, in particular Nicholson who had yet to fully develop his star persona and delves deep into his role of a hardass. Along with Diner (1982), Tin Men (1987), and Liberty Heights (1999), Avalon (1990) is part of an informal quartet of semi-autobiographical films director Barry Levinson set in Baltimore. This film chronicles an Eastern European family emigrating to the city in the early 20th century. Sam Krichinsky (Mueller-Stahl) narrates the story of his life and that of his large family. The attention to period detail is fantastic as is the look of the film – vibrant colors and a warm, inviting color scheme like that of an old photograph. Avalon is not just an immigrant’s story but also about the importance of family. Levinson introduces most of the main characters over a lengthy dinner sequence where we get a taste of their colorful personalities and the dynamic between various members. Back then it was all about the communal experience and the preserving of family history through oral storytelling. After creating several bonafide classics in the 1970s, director Francis Ford Coppola hit hard times in the 1980s, making personal, idiosyncratic films like One from the Heart (1982) and Rumble Fish (1983) and the occasional misstep, like the big budget fiasco that was The Cotton Club (1984). Gardens of Stone (1987) was a low-key affair that flew under most people’s radar but saw the director return to the subject matter of the Vietnam War, which he had so brilliantly tackled with Apocalypse Now (1979). With Gardens of Stone, Coppola focused on how people in the United States dealt (or didn’t) with the war – the wives who grieve over the deaths of their husbands and the mothers dealing with the loss of their sons. Sergeant Hazard (Caan) is frustrated that he can’t train soldiers to fight over in Vietnam and is instead stuck burying the dead bodies that come back. He has his own personal demons but makes a connection with a young, ambitious soldier (D.B. Sweeney). Birdy (1984) is an unusual drama about an emotionally scarred Vietnam War veteran known as Birdy (Modine). He is in near-catatonic state in an Army hospital and believes he is one of the birds he adored as a teenager. In an attempt to reach the troubled young man, his psychiatrist brings in Birdy’s best friend from home, Al Columbato (Cage). This is a story about two damaged people – one internally (Birdy) and one externally (Al). Through flashbacks we see how they became friends, growing up on the streets of Philadelphia, and Birdy’s obsession with birds. Birdy is a thoughtful meditation on the nature of friendship and how this bond is tested by the horrors of war. It features raw, sensitive performances from Nicolas Cage and Matthew Modine early in both of their respective careers.